Dan Carpenter made his only field goal attempt of the game yesterday, preserving his place in Buffalo Bills history. With his 34th conversion of the season, Carpenter became the franchise leader in field goals made in a single season, passing Steve Christie's mark of 33, which was done in 1998. Buffalo made the playoffs that season, but did not this season. Carpenter converted on 34-of-38 field goals this season, putting him at 89.5 percent on the season. His 58-yard field goal sealed a game against the Detroit Lions. Carpenter is a weapon, especially on a team that is incompetent offensively. Carpenter made more field goals than he attempted in extra points (32), and had to be clutch for the Bills on a regular basis. 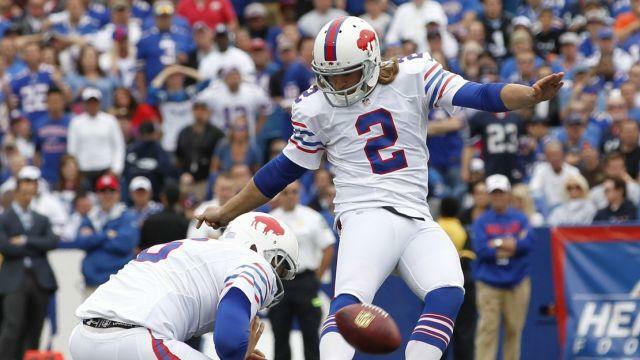 Carpenter is certainly a reliable kicker for Buffalo, and fantasy football owners. He tied Christie's total last season with 33 made field goals in his first year with Buffalo since leaving the Miami Dolphins. It's not clear why Miami would let such a reliable kicker go, but the Bills were happy to benefit from their decision. If the Bills don't get the quarterback and offensive line situations resolved this offseason, Carpenter could have a chance to break his own record again next season. Previous PostBengals’ Rushing Success Hinges on Russell BodineNext PostKnow Your Giants: DE Robert Ayers Jr.